Written for professionals in financial services with responsibility for IT and risk management, Dimitris Chorafas surveys the methodology required and IT systems and structures to support it according to Basel II. The book is consistent with the risk management certification process of GARP, as well as the accounting rules of IFRS, based on research the author conducted with IASB. 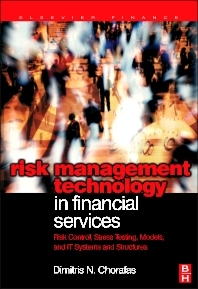 The author provices an in-depth discussion of the types of risk, stress analysis and the use of scenarios, mathematical models, and IT systems and infrastructure requirements. IT Directors, IT Managers, and Risk Mangement Directors in financial services industries worldwide; risk management software application developers in financial institutions and in software firms providing financial applications and solutions; Consultants providing IT and risk management services to the financial services industry.